This is the last installment in the series involving the 312th on Black Sunday. Read the previous installment here. Though Black Sunday was a bitter loss for Allied airforces, the operation it was a part of was an overwhelming success. On April 3rd, the Fifth Air Force attack nearly demolished the 6th Air Division, which led to Lt. Gen. Giichi Itabana being relieved of his command. Twelve days after the attack, Gen. Teramoto withdrew the rest of the 4th Air Army to Manado, hundreds of miles away from the action around Hollandia. On April 22nd, Allied forces landed at Homboldt Bay, Tanahmerah Bay, Tadji and Aitape with little opposition. Operation Reckless was working according to plan. As the 312th reflected on the events of Black Sunday, the biggest obstacle of the day was the weather on the flight home to Gusap. Weather in the Ramu Valley tended to get stormy between 1530 and 1630 each day, which meant flights needed to leave by 1000 to avoid the storms on the trip home. That day, the Group left a little before 1100, though the pilots did not have a choice in the matter. Arriving at the target, there was no opposition from the Japanese in the air or on the ground at Hollandia. Aside from leaving late, the formation missed Hollandia by 100 miles due to a navigation error. The fuel used up during that time may have made a difference for crews as they tried to get home. The men of the 312th tried not to dwell on the events of April 16th. These type of events were the occupational hazards that came with the job of a combat pilot. After the Hollandia raids, their sights were set on other Japanese bases in New Guinea: But, Boram, Wewak and Dagua were up next. Don’t forget to join us on Twitter and Goodreads! Fifth Air Force began attacking Hollandia on March 30, 1944 with B-24 Liberators escorted by 80 Lightnings. They met 40 enemy aircraft, but did not lose any planes. The next day, the heavy bombers went back and finished softening Hollandia for the low-level A-20 attacks scheduled for April 3rd. The 312th’s A-20s would not be alone in this endeavor. 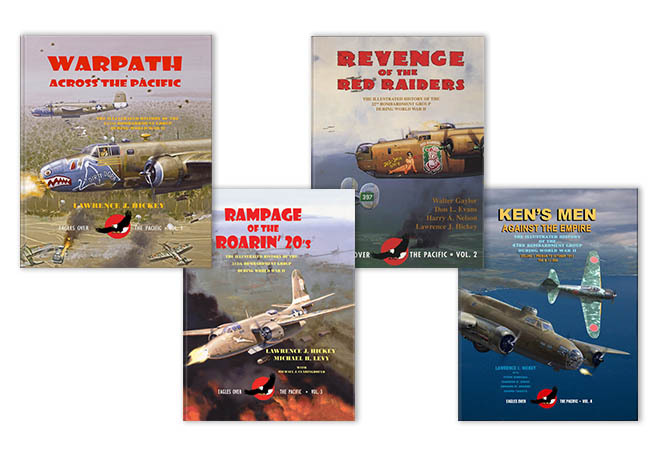 They would be joined by B-24s from the 22nd, 43rd and 90th Bomb Groups, B-25s from the 38th and 345th Bomb Groups and A-20s from the 3rd Bomb Group. The 234 bombers would be escorted by 76 P-38s, which would make this the largest formation of Fifth Air Force aircraft at this point of the war. The 900 mile roundtrip mission would be the longest yet for the 312th. Col. Strauss gave his intelligence officers, operations officers and squadron commanders a thorough briefing the night before Operation Reckless was to commence. He warned the pilots to closely monitor their fuel supply because this mission was close to the 950 mile range of the A-20, and he showed them how to switch between fuel tanks. The Group left Gusap at 0850 on April 3rd, formed up over Dumpu and met up with their fighter cover. The 312th, recently choosing the nickname of the Roarin’ 20’s, flew to Hollandia with the 3rd Bomb Group. When the planes were about two miles away from Hollandia, a Ki-43 Oscar tried to attack the formation, but was quickly taken care of by the P-38 fighters. The B-24s started pounding Hollandia with 1000-pound bombs. 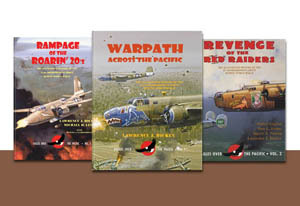 The B-25s and A-20s made their runs after the heavy bombers came through. 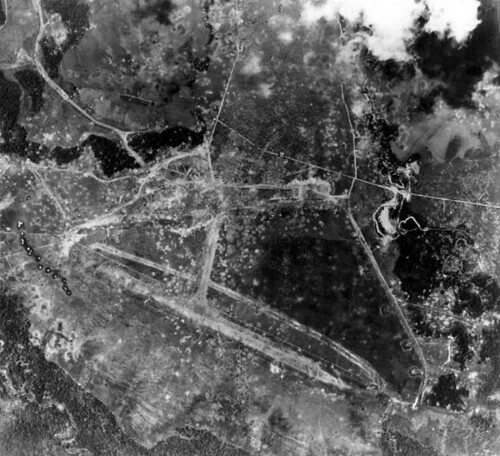 The 312th’s goal was to destroy as many Japanese huts, camps, airstrips, storehouses, antiaircraft gun positions and aircraft dispersal areas as possible. While hitting the targets at 30 second intervals, the A-20s dropped bombs and fired their .50-caliber guns, damaged or destroyed several aircraft on the ground and started many fires. Maj. William Kemble led the 388th Squadron through the heavy barrage of antiaircraft fire, flying his plane up and down to dodge the flak. His gunner, Sgt. William Ernst, had a close call during the flight. A metal fragment from a burst hit a .50-caliber bullet in the chain-feeding mechanism of the right hand gun, causing the bullet to explode and hit Ernst’s dog tag. Ernst was sure he had been shot, but examined himself when he did not see any blood. He looked at his dog tag and realized that had taken the bullet for him. The dog tag was never bent back into shape, but remained a good luck charm for Ernst. After the day’s mission, the pilots of the 312th discovered they did not need to be so worried about the A-20 fuel supply. They had plenty of gas left, so there would be one less thing to worry about on future flights to Hollandia. Fifth Air Force attacked Hollandia again on March 30th, March 31st and April 3rd. During that time, they lost one P-38, but destroyed over 300 Japanese aircraft. 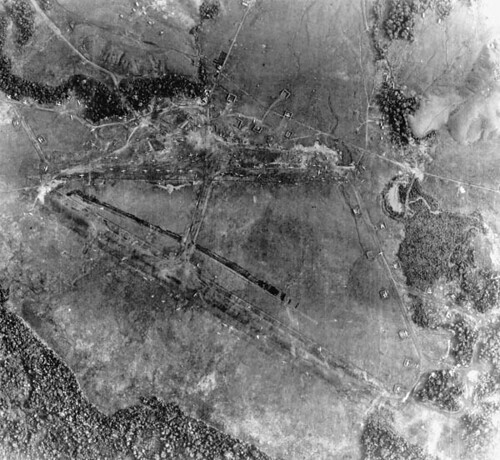 Sixty Japanese fighters came to meet the groups on April 3rd and, to the dismay of the Japanese, 26 of them were shot down. Gen. Kenney was congratulated by Gen. MacArthur in an uncoded telegram to further dishearten their foe. Kenney continued organizing missions to Hollandia on April 5-8th. The 312th was sent to Humboldt and Jautefa Bays to take out various military targets including Japanese ships and barges. The Roarin’ 20’s left the bays enveloped in a plume of black smoke that rose over 1000 feet. The Group was not able to attack Hollandia on the 8th because of the infamous bad weather. 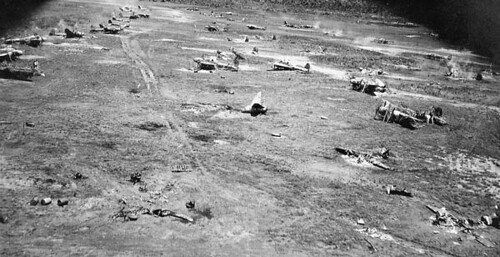 Some of the Japanese aircraft after Fifth Air Force bombed Hollandia. Hollandia, located on the northern coast of Netherlands, New Guinea, was an isolated town captured by the Japanese in April 1942. From there, they built the Hollandia, Cyclops and Sentani airdromes and a satellite strip at the nearby village of Tami. Although Hollandia had its strategic value, it was not a major target until 1944. 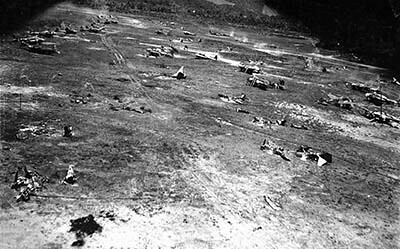 Fifth Air Force finished pounding Wewak, the main base for the Japanese Army Air Force, in mid-March of 1944. The Japanese turned Hollandia into their major base and started a tremendous build up to try and take New Guinea back from the Allies. The Japanese Army High Command figured that Hollandia was out of the Allies’ reach and that they were safe from any attacks. Operation Reckless was in the works when the Americans broke the Japanese military code and discovered that the enemy felt secure. The Japanese had no idea that the newest P-38 Lightning, the J model, was equipped with wing tanks that enabled the planes to fly all the way to Hollandia. Fifth Air Force modified 75 older Lightnings to carry long range fuel tanks as well. General MacArthur planned to invade Hollandia with the use of surprise and deception. With the help of Gen. Kenney, Fifth Air Force was able to lure the Japanese into the trap. Kenney told the P-38 pilots that they could not fly farther than Tadji, a village at least 100 miles away from Hollandia, and that they must not stay in the area for longer than 15 minutes if the pilots became engaged in combat. He also began ineffective night raids to make the Japanese think the Allies did not dare fly daylight raids without escorts. This worked so well that Tokyo Rose began mocking the Allies, and the Japanese started parking their planes near the runways because there were not enough revetments. Kenney wanted to make a low-level strike, but there were many antiaircraft guns that would have to be taken out by the B-24s first. On March 29th, a message from the Japanese Army High Command to Lt. Gen. Kumaichi Teramoto was intercepted by the Allies. This message was ordering Teramoto to move the airplanes stationed at Hollandia because of Fifth Air Force’s planned attack, which made the timing of the B-24 assault urgent. Maj. Gen. Ennis C. Whitehead would be the man in charge of carrying out the attack.